What happens when you decide you need to go back and retrieve that version of the page you edited three days ago, or three weeks, or three months? On the edit post screen, there is a revisions box which lists a different version of the posts in the system. Click on the version of the post you want to review. 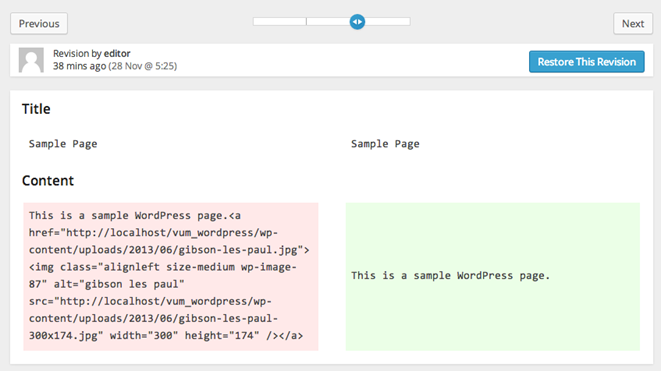 On the compare revisions screen, you can use the timeline slider to compare the changes of the post over time. You can also use the “next” and “previous” buttons to move through the timeline. The redbox on the left, indicates what was changed in the previous version and the greenbox on the right shows the new changes in the latest version. If you want to compare the difference between two specific revisions, tick the compare revisions check box and position the two markers on the timeline to specify the revisions that you wish to compare. To restore the post to a previous version, untick the compare revisions check box, move the marker along the timeline to the revision you want and then click the “restore” revisions and click the update button to save your changes. View are covered in greater detail later on. For now, let’s look at editing some content.